These are some of the geopolitical scenarios the U.S. Army thinks are more likely than not in the coming two decades. Urban combat that makes Sadr City and Fallujah look like cakewalks. Increased terrorist acts after the Iraq and Afghanistan wars end. Economic disaster and massive struggles for natural resources that compel historic enemies to side with one another, against the United States. And, by pure coincidence, all these scenarios just happen to suggest that America needs a well-funded Army to protect it against chaos. 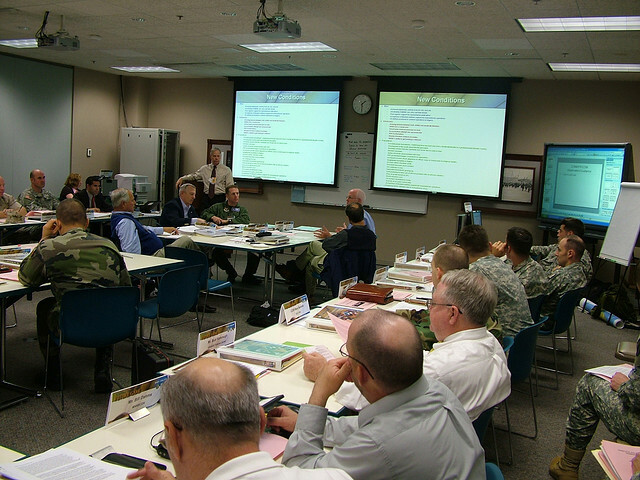 Every year, the Army holds a series of wargames and symposia to help it think about its needs for the near future. It’s called Unified Quest. Last year’s featured much chin-stroking about how to make soldiers more like diplomats and what word could substitute for “counterinsurgency.” It’s a low-stakes affair. But this year isn’t like other years. In a kind of cosmic unfairness, an Army emerging from a decade of ground combat now faces questions about its continued relevance. Former Defense Secretary Robert Gates told West Point cadets to prepare for an era of naval, aerial and cyberwarfare as U.S. interests shift to the great blue Pacific rim. Even retired Army generals think the ground forces should bear the lion’s share of big impending cuts to the defense budget. Unable to envision a future in which the Army is obviously relevant, its senior officials have taken to fear-mongering warnings about forgetting the lessons of 9/11. So to kick off this year’s Unified Quest exercises, the Army convened an “Alternative Futures Symposium” 25 miles outside Washington D.C. Pulling together academics, contractors, diplomats, and soldiers, the team packed into a tony northern Virginia hotel to map out the geopolitical, economic and environmental landscape through 2028. The short answer: The world will become vastly more dangerous — all in ways that miraculously suggest the Army’s annual budget should remain $140 billion. The gist is that the global economy is going to get worse before it gets better. Playing armchair economist — gleaned from airport economic tomes like Aftershock, a book about how to “Profit in the Next Global Financial Meltdown” — Army panelists predicted that recovery won’t take root until 2020. That will lead the U.S. to pull back from its global security burdens, leading resource-starved nations to “go take the oil” in the resulting leadership vacuum, opined Robert Toguchi from the Army Capabilities Integration Center, which sponsored the futurism seminar. Translated from the Army jargon, that means everything the Army does now — from counterinsurgency to prepping for war with another state’s military — it envisions doing in the future. No matter how ridiculous the scenario. The implication: cutting the Army budget is tempting fate. “We’re probably going to have to fight in places we’re not necessarily resourced for,” said Ben Fitzgerald of the security consulting group Noetic. It’s not clear if this year’s Unified Quest exercise will guide the Army’s budget fights. But with top generals unable to articulate a post-Afghanistan role for the Army, the scenarios on display could become the basis for the Army to justify its budget. Yet the seminar demonstrates ex-Navy Secretary Richard Danzig’s recent point that the Pentagon has a terrible track record of predicting the future. “We’re not trying to get it exactly right for 2028,” explained Col. Kevin Felix, who ran the exercise. “We’re just trying not to get it totally wrong.” Felix might want to try harder.